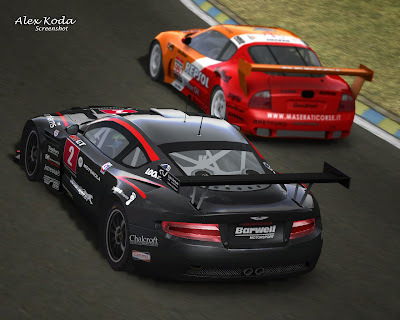 RMT statement :As you may know we are working on a conversion of our WSGT mod from GTR2 to rFactor. The conversion is about 75-80% done at the moment. Unfortunately progress is very slow at the moment.One of the RMT members signed a deal at Slightly Mad Sudios , working on their future Race gaming titles. We wish him all the luck, and find he surely deserves his spot in the commercial world. RMT is sure he will make us all feel proud we had him in the original WSGT Team. That causes even more of us have to rather work on the new WSGT2 mod and not on a conversion of a mod we’ve been working on for over a year. It would be a shame though, if the mod wouldn’t be released. Therefore we’re looking for help from the community to finish the mod. Right now the basic conversion is almost done except from some parts and lod’s. Besides the basic conversion we’ve modelled new wheel models for all the cars, replacing the GTR2 originals. Most of these are still in 3ds Max, unmapped, and need to be converted to rFactor. We can help with texturing the wheels. The phyiscs of the cars are the same as the GTR2 versions except for all new tire physics. if possible we’re also looking for someone to tweak the suspension file to make them the cars realfeel compatible. We can provide you with all the needed templates and 3ds Max scenes. - Basic GTR2 - rFactor conversion of some models, physics and liveries. Unfortunately I'm just a skinner...lets hope that some of you can help them because this mod its going to be "the ultimate mod for rFactor"